2. Maximum peak beam intensity of 12670cd and maximum throw of 226m. 3. An optical system combined with crystal coating and "Precision Digital Optics Technology"(PDOT). 4. High effciency constant circuit provides stable output up to 250 hours. 5. The metal side switch controls 5 brightness levels and 3 special modes. 6. A power indicator beneath the side switch indicates the remaining battery power. 7. The power indicator can also display the battery voltage(±0.1V). 8. Rigid double layer tube design. 9. Built-in charging via micro-USB port, so convenient to be charged at home or on the go. 10. NL1835HP 3500mAh 18650 rechargeable battery included. 11. Incorporated advanced temperature regulation module and electronic reverse polarity protection. 12. Optical lenses with double-sided scratch resistant coating. 13. Constructed from aero grade aluminum alloy with HA Ⅲmillitary grade hard-anodized finish. 14. 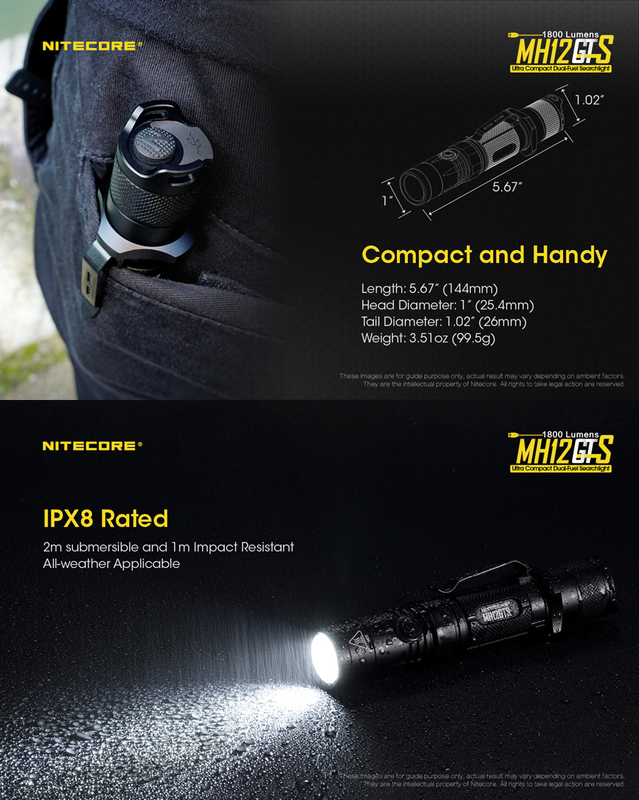 Waterproof in accordance with IPX8 (2 meters submersible), and impact resistant to 1 meter.